The US$ is "King of the World" at the moment. The resulting weakness in markets has brought mortgage rates back into positive territory for US consumers. I have a special comment up at XE.com. Given what has been happening with corporate profits, and the likely impact of China's currency devaluation, this really shouldn't be a surprise. To find out, click on over to my new post up at XE.com. See, I can write a clickbait headline just like Business Insider! The implications of the child care cost crush for median household income and "shadow unemployment"
The other day I showed that there is compelling evidence that the primary reason for the long term decline in the Labor Force Participation Rate in the 25 - 54 age range is the increasing real cost of child care, coupled with stagnant to declining real wages in the lower paying jobs typically taken by the second earner in a two earner household. 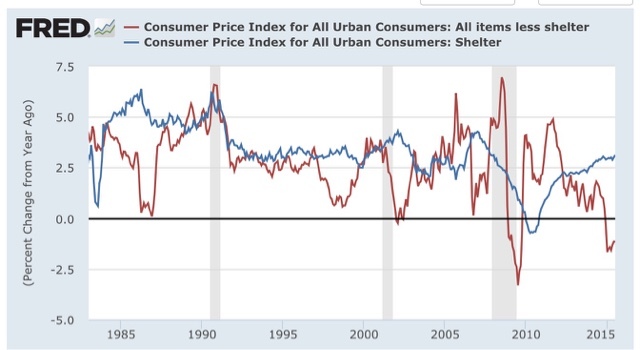 Today I have a few more precise graphs, and discuss the implications for median household income and the issue of "shadow unemployment" or "missing workers." thie number of people aged 25-54 who told the Census Bureau that they were out of the labor force, but wanted a job now, peaked in 2011. 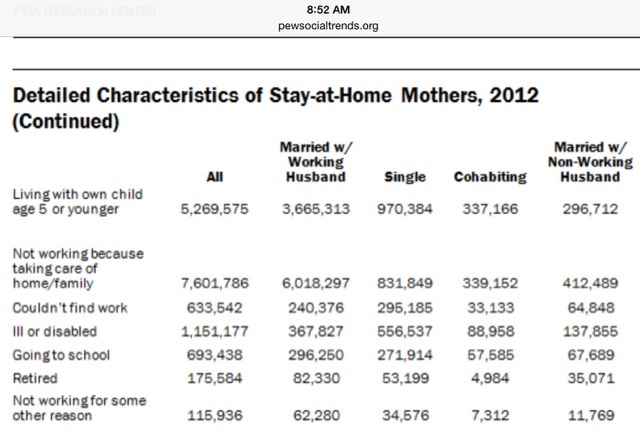 The Pew study found that as of 2012 the vast majority -- 85% -- of stay at home married mothers say the reason for not working is to take care of their children. 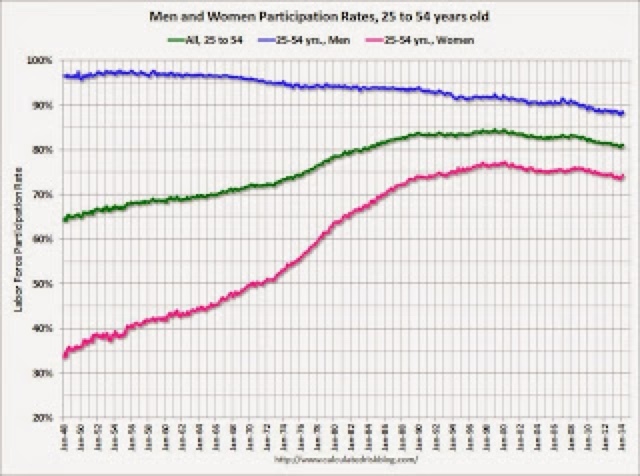 Note also that the number of women staying at home is much larger for age groups 25-54 than for those either young or older. The only thing not making this the ultimate "smoking gun" supporting the child care cost crunch thesis is that the study makes no comparison with 1999. Aside from the unemployment rate, working age people dropping out of the labor force due to increasing child care costs is the most important reason for the failure of median household income to return to its level in 2000. After all, giving up a second income necessarily means that the household's income is less than otherwise. 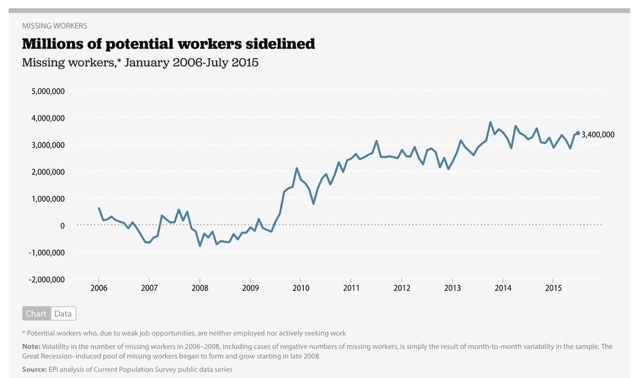 Finally, here is a graph of what the Economic Policy Institute calls "missing workers:"
potential workers who, because of weak job opportunities, are neither employed nor actively seeking a job. In other words, these are people who would be either working or looking for work if job opportunities were significantly stronger. Because jobless workers are only counted as unemployed if they are actively seeking work, these “missing workers” are not reflected in the unemployment rate. Note that this has been rising since 2007, unlike virtually all other metrics. I have been critical of this measure, which is based on projections from a 2006 Regional Fed study. The Census Bureau's series "Not in Labor Force, Want a Job Now" measures exactly what the EPI claims to be calculating, and that peaked out about 4 years ago. To the point, parents who stay at home to raise their children and tell the Census Bureau month after month that they quite simply don't want a job now are not "missing" from the unemployment rate. But since increased wages, especially for lower quintile jobs, change the equation for families considering whether to have the second spouse work, i.e., increased real wages should result in more spouses opting to work, the Center's "missing workers" statistic, including its continued slow rise, makes perfect sense if we describe it not as those who have dropped out of the work force, but would return if the job market was strong, but rather as those who would return to work if wages were better. The effects of the child care cost crush not only unravel the mystery of the decline in the prime working age Labor Force Participation Rate, but it is also the missing piece in the puzzle of the similar secular decline in real median household income, and the rise in "missing workers." Once we include these effects, almost all of the mysteries in current labor market statistics disappear. So let's look at a couple of useful bits of information. Basically, all of the existing trends are still intact. I have a new post up at XE.com analyzing this morning's housing permits and starts report. We are neither Delivered nor Doomed. Do rising child care costs & stagnant wages explain the declin e in the Labor Force Participation Rate ? 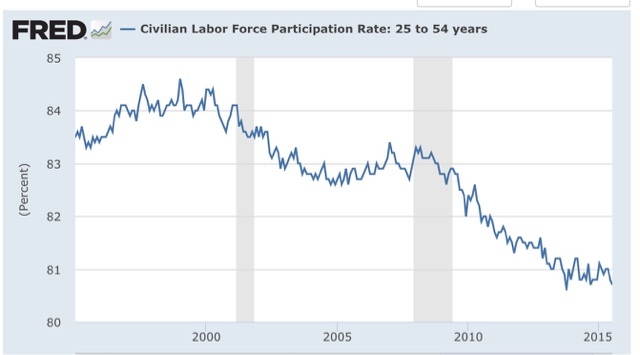 What is driving the long term decline, shown in the graph below, in the labor force participation rate (LFPR) among prime working age adults, ages 25-54? 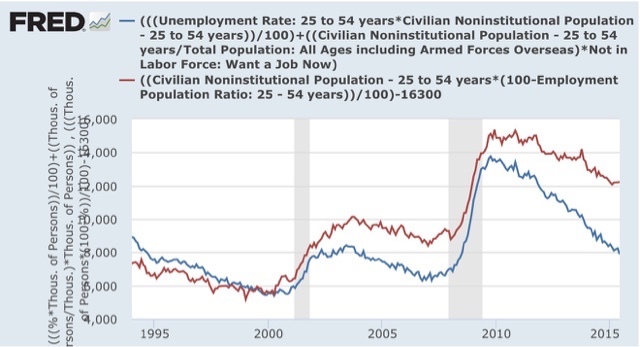 If the primary explanation for the decrease in the employment-population ratio for ages 25-54 were the inability to find a job, the result of the two calculations should be the same. In fact, the second calculation (in blue) gives me a much lower value. That tells us that the primary driver of the increase in persons not being employed in age group 25-54 is not poor job prospects. There is compelling evidence that the main culprit is increased child care costs, paired with stagnant or declining real wages. Let's start with a framework for the discussion. Many families face a familiar choice between hiring a contractor vs. doing it yourself for a variety of tasks. For example, do I mow my lawn myself, or do I let a landscaper do it? All else being equal, higher costs for hiring a contractor will cause some increase in the number of homeowners who decide to do the task themselves. The same process would apply to other tasks, like hiring a painter or someone to install a new automatic garage door. But since all of the above tasks can be done on nights or weekends, a choice to perform them doesn't mean the homeowner doesn't have to give up time from work to go the DIY route. Child care stands alone. A choice not to send children to day care inevitably means limiting at least one spouse to part-time work, or dropping out of the labor force entirely. In other words, the cost of day care must be weighed against the income earned from a job. This is a balance: the higher the cost of daycare, or the lower income earned from a job, the more we should expect a parent to choose part-time work or dropping out of the labor force entirely. So, what has been happening to the costs of child care? And what has been happening with real wages, especially in the lowest two quintiles of paying jobs, which a second income earner in a household is likely to be in (the primary earner by definition holding a higher paying job)? There is strong circumstantial evidence that both the real cost of day care has risen, and real pay in the lowest two quintiles has been particularly hard hit. In other words, the data supports a hypothesis that the secular decline in the LFPR among working age families has largely being driven by the issue of child care. There’s been a growing push for childcare workers to be better trained and educated, and the costs associated with those efforts make it tougher for managers to scrape up pay increases for existing personnel, said Anna Carter, president of the Chapel Hill, North Carolina-based Child Care Services Association.The mismatch in supply and demand has made childcare a “broken market,” said Marcy Whitebook, director and founder of the Center for the Study of Child Care Employment at the University of California at Berkeley. 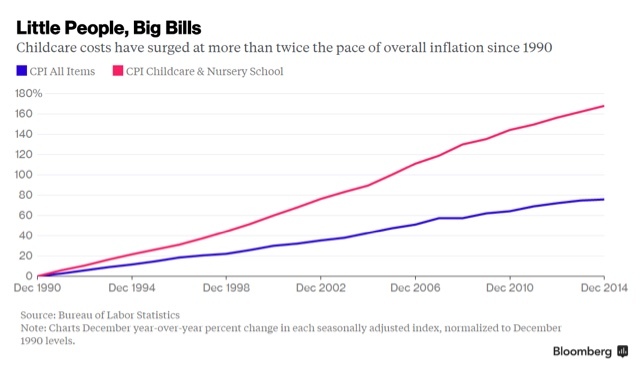 "Mothers who do work are paying more than ever for child care. In inflation-adjusted dollars, average weekly child care expenses for families with working mothers who paid for child care (24% of all such families) rose more than 70% from 1985 ($87) to 2011 ($148), according to research by the Census Bureau. For those families, child-care expenses represent 7.2% of family income, compared to 6.3% in 1986 (the earliest year available). Last year, the average cost of child day care in the US was $11,666, according to Babycenter.com. Meanwhile, an earner at the top of the 5th quintile, working a full time job, is making about $19,000 a year; a worker at the top of the 4th quintile, about $25,000. 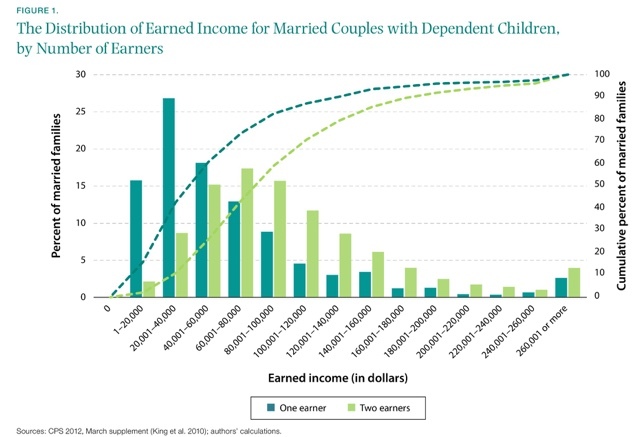 That means a household with a second earner whose job pays among the lowest 20%, and well into the lowest 40%, might actually have a net financial gain by foregoing the second income to dispense with day care costs, and get the benefit of having a parent at home full time to run the household and be with the kids when they aren't in school. 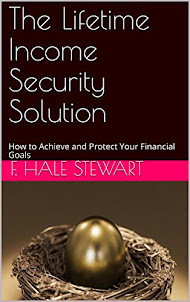 While I have been unable to locate any data specifically quantifying the average or median incomes of primary vs. secondary earners in a two income hosusehold, a 2009 study by the BLS found that the median part time secondary earner makes 62.8% of part time primary earner But if anything, that percentage is too high, since most two income households are probably either both full time workers, or a full time worker and a part time worker. More to the point is a December 2013 paper by the Hamilton Project, which found that the median 1 earner family income was ~$40,000, while the median 2 earner family income was ~$60,000. By implication, the median part time earner only makes about 1/2 of primary earner, $20,000 vs. $40,000. Even that disparity is probably underestimating the true number, since the primary earner by definition is earning more, and is probably earning more than the median of all workers. Remember that we are dealing with the *change* in the cost-benefit analysis that families make. As a simple matter of supply and demand, that day care costs have far outrun inflation, and that real wages among the lower two quintiles of jobs have declined, and declilned by more than the upper quintiles, implies that more parents would make the choice to stay at home. By this time, the kids are in college if not already out of the house. The new Pew Research Center report found that in 1989, only 5 percent of the 1.1 million at-home fathers said they were home to be primary caregivers. That share has increased four-fold now to 21 percent, a sign not only of the power of economics in reshaping traditional family structures, but of shifting gender norms. "The assumption that a lot of people make is that the number of stay-at-home dads went up because of the recession. And while that’s absolutely true, even if you take out that trend altogether, the fact is the number has been going up over time, regardless. And the biggest increase is in the share of fathers who want to stay home to take care of kids," said Gretchen Livingston, author of the new report. "That’s very striking." The Pew Research study findings are nearly a "smoking gun" in support of the thesis that that the increase in stay at home parents are the force driving the decrease in the prime working age LFPR. In other words, even shortly after the end of the recession, 45% of the entire increase in stay at home dads since 1989 was in order to raise the children. While by no means a perfect fit, that is still pretty close to a "smoking gun." 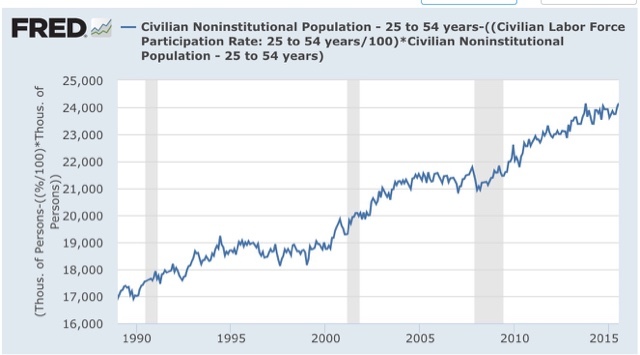 Update: The BLS tables show that between 2001 - 2014, the number of people age 25 - 54 who are not in the labor force and did not want a job increased 3.3 million from 17.8 million to 21.1 million. No graphs, but the raw data can be found here. While not directly comparable, Pew showed an increase of this number by 2.6 million from 1989 through 2012, the lion's share of which occurred after 2000. That means the only missing piece of the puzzle is how much of the increase in women staying at home, about 600,000 from 1989-2012 as derived from the Pew data, is for child care reasons. The share of mothers who do not work outside the home rose to 29% in 2012, up from a modern-era low of 23% in 1999, ... A growing share of stay-at-home mothers (6% in 2012, compared with 1% in 2000) say they are home with their children because they cannot find a job. A little math shows that the number of stay at home moms for reasons *other* than inability to find a job has risen by 4.5% from 22.8% in 1999 to 27.3% in 2012. The Pew study on women does not break down this remaining number by those staying home due to disability, retirement, education, or other reasons besides raising children. Of course this is not conclusive, and correlation is not necessarily causation. 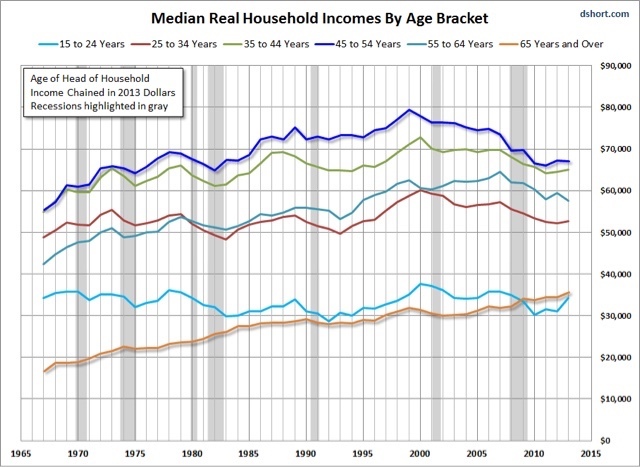 In particular, I have no information as to how the real median wage of second earners has changed over time. the decision to be a stay at home jparent in a two earner family should rise when child care costs rise and/or lower quintile wages fall. although we do not have the equuivalent data for women, the cirucmstantial evidence is compelling that the i ncreased real costs of child care vs. wages are the primary explanation for the secular decline in the LFPR among working age families over the last 15 years. 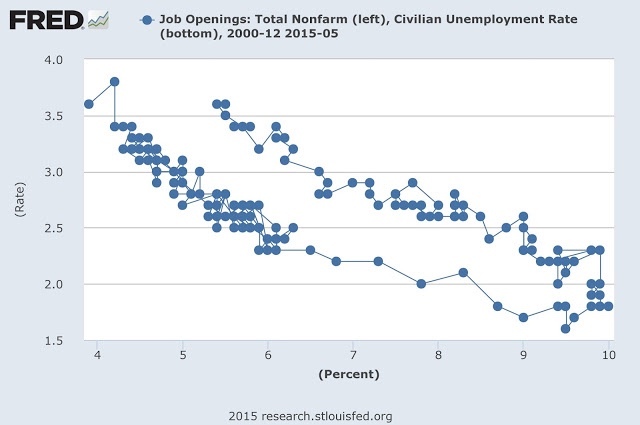 Via Mark Thoma, Prof. Stephen Williamson writes a nice, thorough post on the state of the labor market, which is well worth reading in full. Early in the post-recession period, people were speculating as to whether the rightward shift in the Beveridge curve was due to cyclical factors (the Beveridge curve always shifts rightward in a recession) or some phenomenon related to mismatch in the labor market (the unemployed don't have skills that match well with the posted vacancies). Perhaps surprisingly, the Beveridge curve has not shifted back, with the end of the Great Recession now more than 6 years in the rearview mirror. That would seem to put the kabosh on cyclical explanations for the phenomenon. But it's not clear that mismatch fares any better in explaining the Beveridge curve shift. 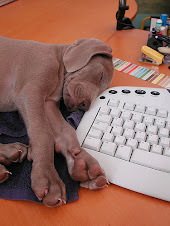 If that's the explanation, why doesn't the mismatch between the searchers and the searched-for go away?" Employment growth is currently strong, and by most measures the labor market is currently somewhat tight to very tight. 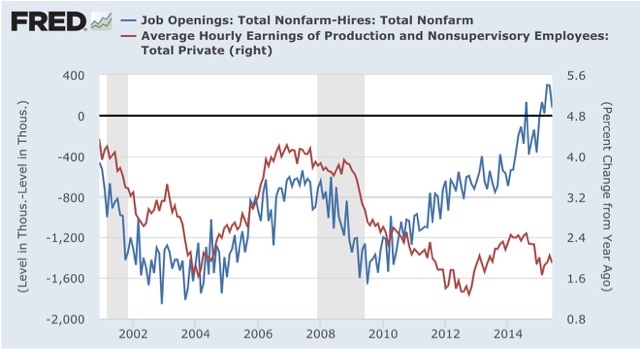 In other words, the labor market is tight because even with a U3 unemployment rate of 5.3%, job openings are soaring. Although he doesn't mention it, there are more job openings now than even during the height of the tech bubble at the beginning of 2000! 1. 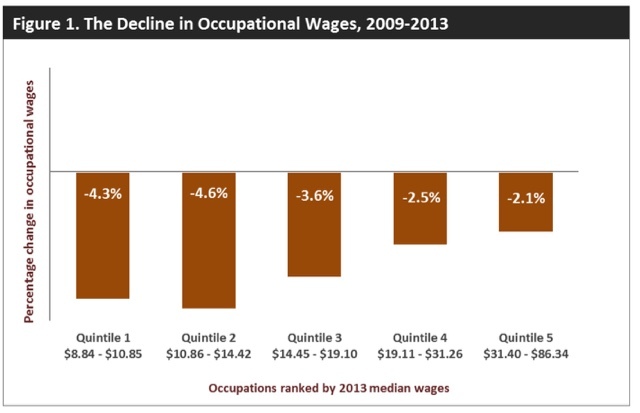 During 2011-12, wage growth declined. Unfilled vacancies rose. 2. In 2013-early 2014, wage growth improved. Unfilled job opensings plateuaed. Note that at 2%, YoY wage increases are well below even the 2003-07 average of about 3.5%. 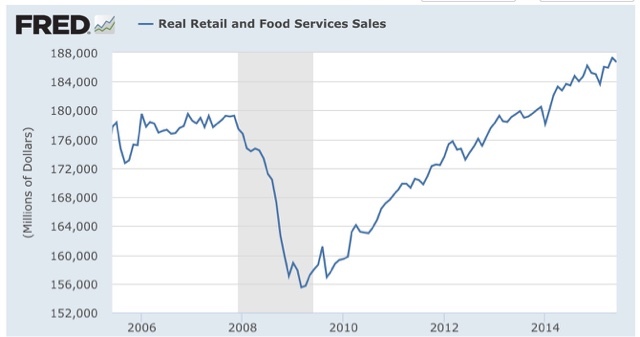 This is a market which is not clearing. Prospective employers and employees are at a standoff. To put it less charitably, employers can't find workers to fill their job openings ... for the paltry wages they want to pay them. 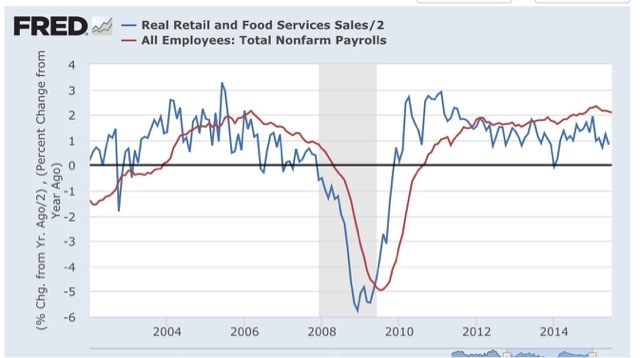 With near record corporate profits, that isn't a tight labor market. It's tight-wads.